We are children with principles. We say "No" to everything that is bad, evil, and that which destroys. We live holy lives according to the Bible. We defend what is right and uphold what is just. We are grounded in God's Word and we cannot be swayed by what is false. We are responsible thinkers and doers for we know that our thoughts and actions do not only affect us but our loved ones, our friends and even the innocent strangers. We live by example. We are children with a mission. We are here for a reason and that reason is to serve God and bring glory to Him. No matter how hard life deals with us, we will not be discouraged. Our eyes are fixed on our mission and we are determined to carry it out for we know that even though our body is fragile, our spirit can never be broken. A recent quote: In her keynote address, Social Welfare Secretary Corazon Juliano Soliman thanked the winners for taking the lead in focusing public attention on child-related issues. She noted the dire statistics that make children "among the most needy sectors of society." Out of the total population, she said, 43 percent are below 18 years old. Of these, five million children are unable to attend school; 3.7 million are working, and 2.2 million of these working children are exposed to hazardous conditions, "leaving them malnourished, susceptible to disease, intellectually and physically stunted with low self-esteem." 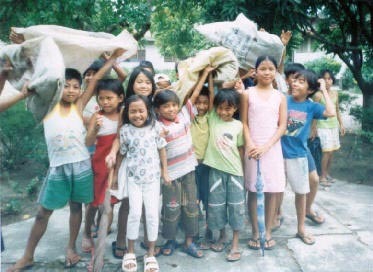 Street children in Metro Manila alone, Soliman added, number 258,074. The UNICEF has given priority to programs for street children. Barahan, Occidental Mindoro has topped the chart as the number one village with the most number of malnutrition in the whole island of Mindoro according to a local doctor. 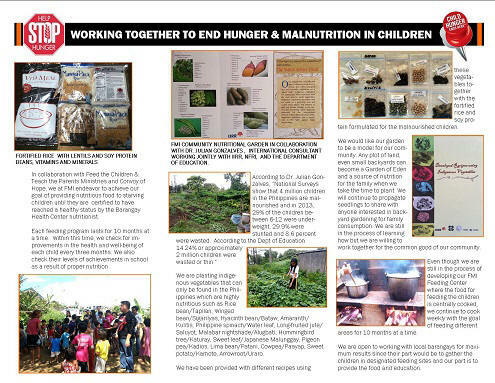 In answer to this call to help the children we have set up a program called "Health Restoration Program" where we give daily intake of vitamins and milk to children who are undernourished. We started HRP a year ago and 23 out of 25 children have graduated from the program. The other two are still being restored. Another 23 malnourished children have been added this year. We intend to keep the children in the program until they are declared "healthy" by the Village Health Clinic. Part of HRP is to de-worm the children every 6 months. 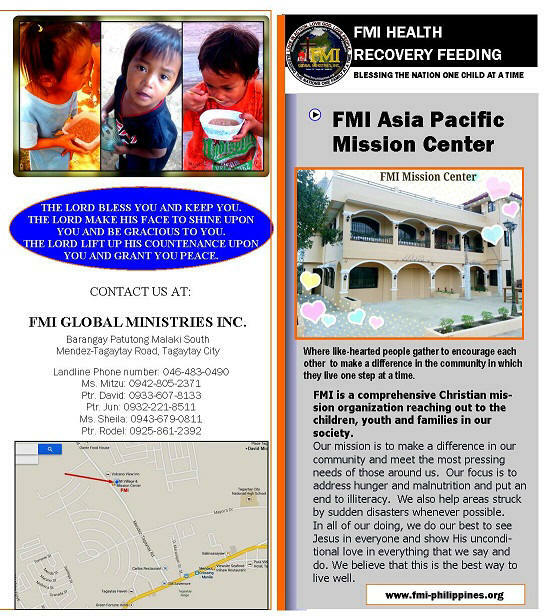 FMI works with the local health workers as part of its community service. Bro. Richard Balanay goes around the whole village to administer the vitamins and milk to every child enrolled in our program. We have recently purchased a bike with sidecar for him to ride around. Riding around sandy streets under a very hot and humid weather everyday for hours and hours is not easy but Bro. Richard is willing to make the sacrifice to show God's love to these needy children and their family. Someday, if God would have it, we hope to buy him a motorbike with sidecar (tricycle) to make his task much easier and cover more distances for children living in very far corners of the village. 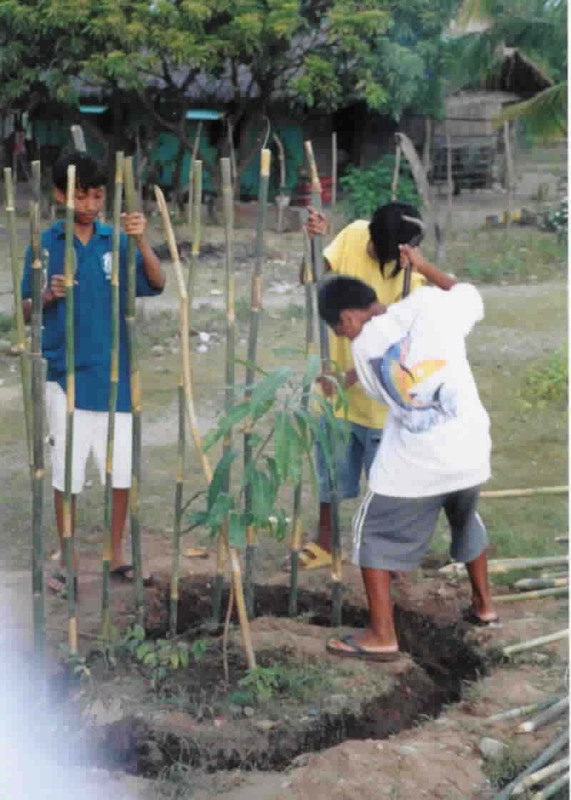 In the 2004 Annual Mission we had our Tree Planting Project inauguration where we initially planted 12 mango trees along the road side. 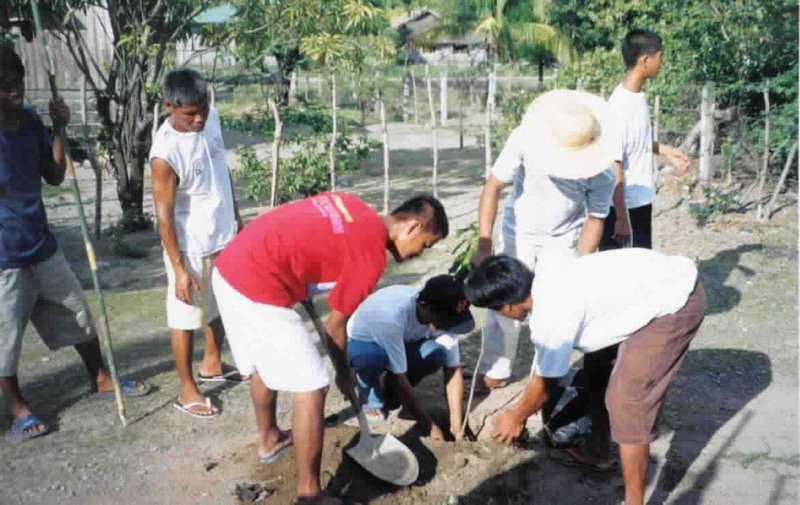 Our goal is to plant as many trees as we can by mobilizing our team of children, youth and adults. This part of Mindoro has suffered drought due to the rampant illegal logging going on especially in the mountain areas. As a response to this growing environmental concern, we have decided to make Tree Planting a part of our ministry to the community. 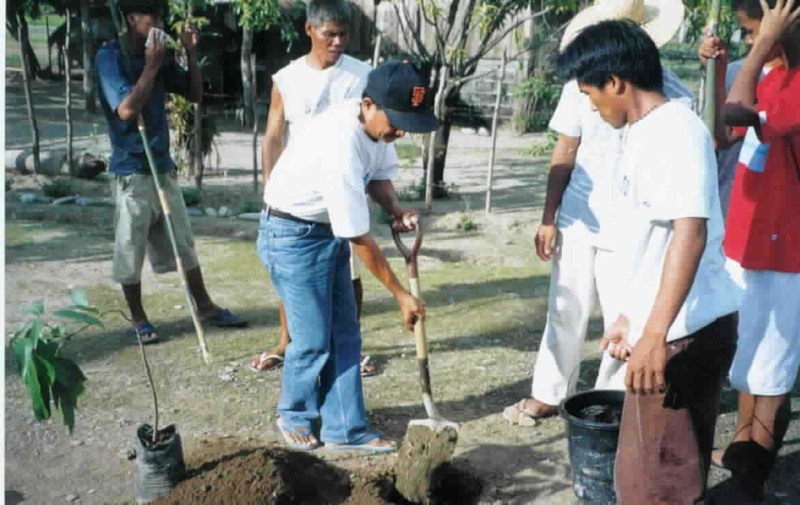 The local officials have expressed their support by backing up this project and even requesting trees from the Department of Environment and Natural Resources (DENR). 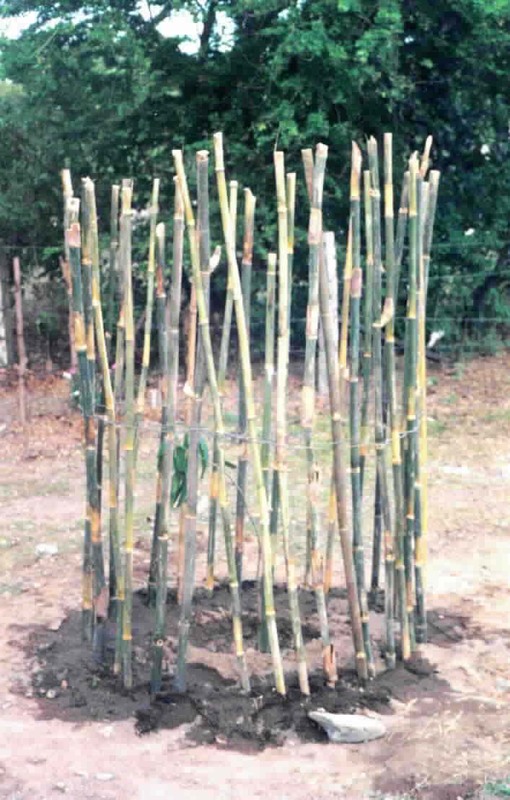 Our 5-year goal is to plant 1000 trees in the village by 2010. Please pray for this project to come to pass and for the people to realize that God is in control of nature and for the salvation of every unsaved souls. Kids carry sacks to use as garbage bags for the litters they pick up from inside and around their school compound during the Saturday Community Service. Cleaning their own turf make children aware not to throw their trash just anywhere. They learn to value cleanliness and learn to care for their immediate environment. Every Saturday morning, these youth and children come to the sea shore for dawn-watch prayer. Afterwards, they have a coastal clean up picking up litters from the sea shore. JR had four successful surgeries. The doctors operated on his left eye, his right armpit, his neck, and his lips. He only has one more part of his body that will be scheduled for operation in April - his left arm. On May 16, we went to to San Juan, Manila to visit him and to be there for the 700 Club - CBN Asia interview. It was not easy to find Mommy Net's house (JR's foster parent, where he stayed before and after his operation). We heard that she had other children living with her and so we brought some food for them. When we found her place JR's mother, Rose, was waiting for us. Guess what? JR was nowhere to be found! So they had to fetch him to tell him we had arrived. In a flash he was right at the door in his neck brace! He had been playing with his friends as if he never had an operation. JR & Rose stayed with us at the Christian Development Center in Tagaytay City for two days and then they had to leave for Mindoro. His favorite food is fried chicken so we took him to McDonalds and Jollibee to celebrate. Now, JR is excited about his future. 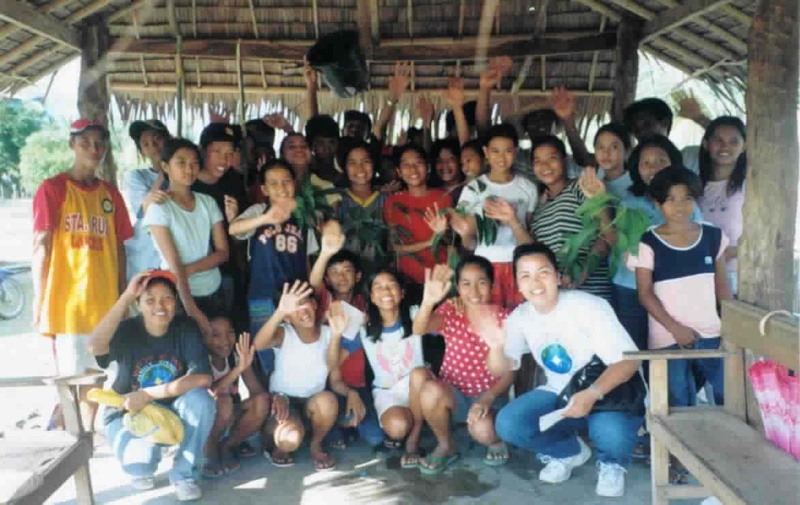 He is now assisting in the children and youth ministry. When asked what he would like to become... without hesitation he declared he wanted to be a missionary. Before school started in June we bought Arvee three pairs of black shorts, three white shirts, a pair of tennis shoes, 3 pairs of white socks, a backpack, a belt, and a baseball cap. As soon as he got his backpack he went inside his house and got his complete set of school supplies that he received as his reward for completing the Summer Bible School program. 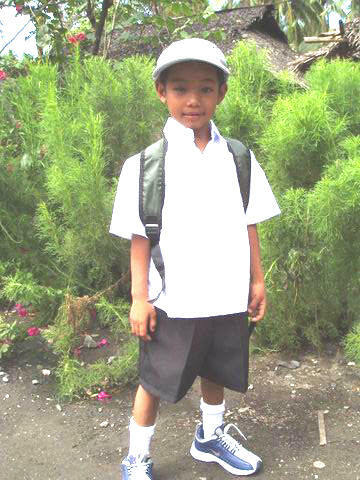 He is now a Grade 1 student in Dayap Elementary School and a beneficiary of our Scholarship Program. Arvee's surgery is finished successfully - Pictures coming soon! JR - Laboratory has been prepared by doctors for his plastic surgery already! Please continue to pray for him & that support will continue to come as this will be an expensive process. VICTORY FOR ARVEE - SURGERY COMPLETED DECEMBER 15TH. DECEMBER - WE FOUND OUT ARVEE HAS ASTHMA AND THE DOCTORS HAVE BEEN TRYING TO TAKE CARE OF THAT BEFORE OPERATING. 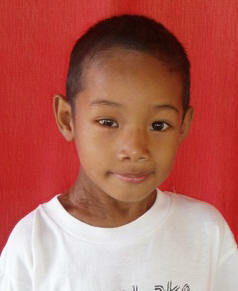 ARVEE MEETS WITH THE DOCTOR ON DECEMBER 6TH - PLEASE PRAY THAT HE WILL BE READY FOR SURGERY. November: All lab tests have been done again due to hospital misplacing previous one. We are now waiting for the results. If the results are clear then the operation will proceed. Mid October: The operation of arvee is still on pending case due to the result of his Chest xray,no official result yet,but we are perseverely following it up.The result maybe release today. Regarding with the blood, we have a reservation at the PGH laboratory for his operation. But its better for the two donors to pursue donating for Arvee vigilia's name in the laboratory. 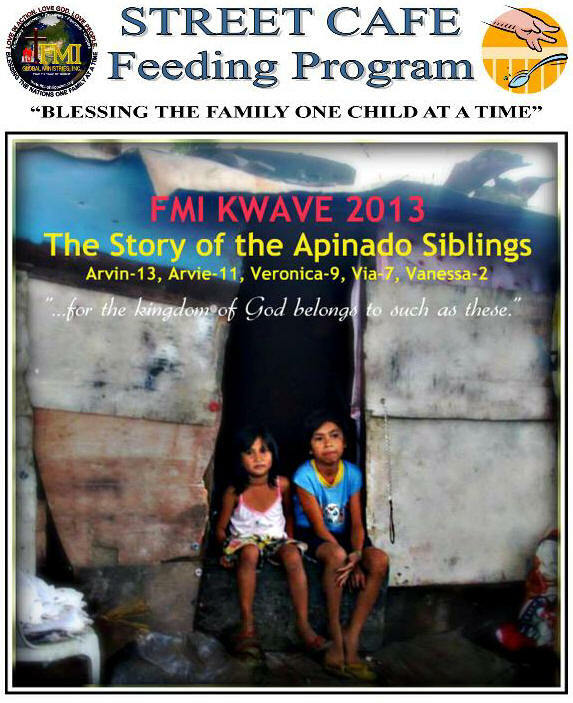 Arvee and mother are still staying with one of our volunteers, they spend Php700 for transportation and food per week. The amount prepared for the Operation is Php4500,post op meds not included. May we request for your assistance regarding this matter. Will update the schedule of operation. We are living in exciting days! JR who has been waiting so long to be cleared for his operation got his lab work clearance and God willing the surgery will go forward. Can you imagine this little boy who never had any hope of having this done... a boy whose parents are subsistance farmers and had never even ever hoped to see the inside of a hospital let alone find a way for their boy to be attended to... And now wonder of wonders, miracles or miracles it is happening. All they have to do is find an open bed in the pediatric surgery department (see below the doctors email to us). And now also, they have called JR (the badly deformed boy burned all over his head and torso - he actually looks like a monster) to Manila to begin the process. He is seeing the Plastic Surgery doctors this afternoon to begin. Bro. Jun our worker from Mindoro has accompanied him and his mother. We have found them a place to live with our relatives in Manila and also borrowed to take care of their transportation and living expenses for now. We are so happy that this is now closer than ever before. Did you know that the desire of JR's heart is to be a general in the Lord's army. Mitzu and him talked about that before and he is so determined that he will be "a general in the Lord's Army". Praise God, we heard good news from my Mom just now. While on a bus, my Mom was text messaging trying to get a hold of the only person she knows who wanted to donate blood, but to no avail. She was already very discouraged by then. When the bus made a stop, the person next to her bought a drink but had a hard time opening it. Mom immediately offered to help and was able to open the top with her Swiss knife. As her usual way even with strangers she started a conversation with him. She told him about her despair at not finding a blood donor for Arvee. She found out that he is from the Visayas province and so she talked to him in his local dialect, Ilongo. She learned that the man is a missionary and his name is Larry Lanuhan. He offered to help her find blood donors from among his fellow missionaries. Just this morning she received a phone call from him and told her that he found two volunteers already. Their names are Jun Huenva and Armel Raman. He said that tomorrow, October 12, they will proceed to Phil Gen Hospital to donate their blood. Mom said she cried at how God so quickly answered her prayers. Our prayer request now is that their blood type would match Arvee’s and that the operation would be a successful one. All is in God’s hands. Pray also for the three missionaries who so selflessly came to Arvee’s aid though they do not know the child. They are angels on earth sent by God. Maybe with their blood flowing in Arvee’s veins, he too will be a missionary someday. It’s a thought. Praise God, a friend of ours gave $160 to be used in opening the God’s Precious Children fund to help Arvee and JR with whatever unexpected needs and expenses that may arise that is not covered by Operation Blessing. 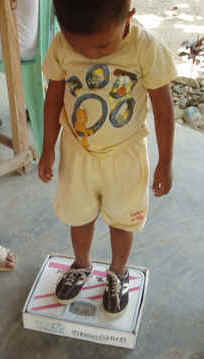 Pray that this seed of faith will increase so that more children with special needs will be blessed. Glory to God! Operation Blessing representative and brought to the foster family's house. and their parents. They said they were very blessed because the message was apt to their situation and very much encouraged that God is in control. post-op medications will cost. There is no problem with travel expenses going back to Mindoro as we will cover that. Our only concern now will be the cost of post-op medications and medical supplies, food, miscellaneous living expenses to give to the family (as they, like many other families, are in the middle of "kiriwi" (local economic recession right now). to our doorstep... one life at a time. 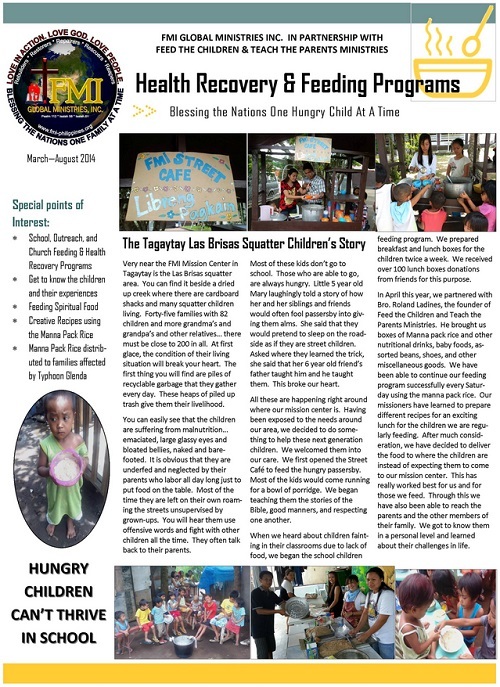 We will open a God's Precious Children's Fund (GPC Fund) where all donations for this cause will go to help the children with travel expenses, food, post-op medications and medical supplies, even operation cost if we can't find an organization (like Operation Blessing) willing to help them. This will also include the cost of sending them to school and miscellaneous living expenses for their family to help them cope with the first month or two of the child's recuperation period. We will be helping more children (the ones God will bring to us) get help because we know that if we don't, who will? It may seem a big task but it's really not. GOD IS BIGGER. If He brings children He will provide for them. You could be God's arms too if you are willing and you can be His angels on earth. Please pray about it. Your prayers are very valuable to us so please pray for Arvee's fast recovery, comfort & strength for Andrea. 1. Financial provision for their travel, food and lodging expenses. Living expenses in Manila is not cheap. Arvee and his mother don't have any money at all and will only be relying on other people's generosity and charity. 2. A place in Manila for Arvee and his mother that is close to the hospital. 3. Successful surgery. Let there be no infections nor complications. 4. Doctors: for God to guide their hands and give them wisdom to know exactly what to do. 5. A normal life for Arvee after the surgery and to be able to go to school. We plan to send him to school next year through our scholarship program. He will be 6 yo then. JR's case is more complicated as he will probably have to undergo a series of plastic surgeries to bring back a semblance of normalcy in his badly deformed face. Please pray that the doctors will have compassion on him and perform the surgeries out of charity. JR is eagerly looking forward to becoming a normal boy with a brighter future. We'll keep you updated as to their progress and the exact time of the surgery for Arvee. Thank you very much for caring for these precious children of God. We have faith that our concerted prayers will move mountains and part seas, in Jesus' name! Praise God, JR & RV will be scheduled for surgery sometime in August 2004. Our contacts at Operation Blessing assured us that help is on the way! We need your prayers that the operation will be a success and that God will give the surgeons wisdom as they operate. DECEMBER 2004 - JR IS HAVING PROGRESSIVE MEETINGS WITH THE PLASTIC SURGEONS AND IS EVIDENTLY NOT FAR AWAY FROM STARTING. > he has no land of his own therefore if he doesn’t get hired he doesn’t get paid. > she has to work as another family’s servant to earn $30 a month or less. JR’s parents earn a monthly combined income equivalent to $50. JR and two of his siblings don’t go to school for lack of financial means. His oldest sister is in 3rd year college supported by World Vision. JR went to school for a very short period of time when he was 11 years old. He was admitted in Dayap Elementary School as a Grade I student. We was told that he did well in school and was fourth honor in his class. While in school he was always the object of ridicule. He loved school even though he did not receive fair treatment from his classmates and the people around him. The first time we met JR he joined our Children’s Bible Program. There were 48 other children in our class then. He actively participated in the program, asking and answering questions. 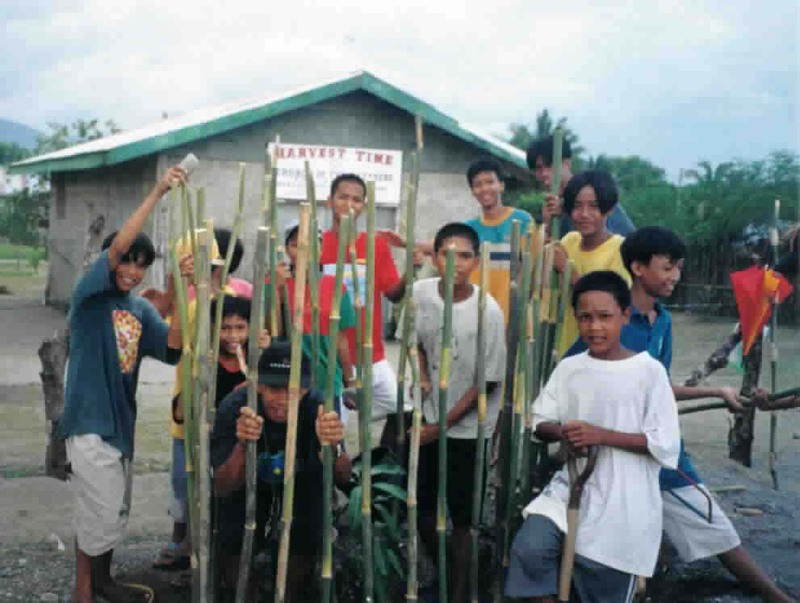 Before moving to Barangay Barahan the Bahia family lived in a remote area in Barahan. Two years ago we get to talk to his mother and she recounted the story of his unfortunate accident. (Also based on recent interviews conducted this month). She said it was on JR’s 3rd birthday when the accident happened (Nov 15, 1992). At 10:00pm that eventful night JR woke up thirsty. He called out and asked for water but no one heard him and so he decided to get up and get the drink himself. He was very sleepy and didn’t notice that he was walking straight into the gas lamp hanging above his head but not high enough to miss it. His head hit the lamp. The burning flame trickled down his head, his face and down to his neck, chest and arms. JR screamed in terror. His parents’ woke up and were terrified by what they saw. His father’s initial reaction was to embrace him hoping to put out the fire. He did this several times and pulled JR’s burning semi-nylon t-shirt over his head consequently scraping the severely burnt skin from JR’s face. His face was badly disfigured in the process. The fire has also damaged his left eye. They looked for a Jeepney (transportation) everywhere and found one a kilometer away. The jeepney arrived to their house two hours later. They rushed him to the nearest medical clinic in the town of Sta. Cruz but upon seeing his condition the doctor told them to go directly to the hospital in Mamburao. It was a third degree burn. There they cleaned the burns, put ointment and covered the treated area with gauze. After a week when there was no sign of improvement, he was brought to the Regional Hospital in Batangas City to receive further treatment. JR was admitted in the ER where he was bandaged. 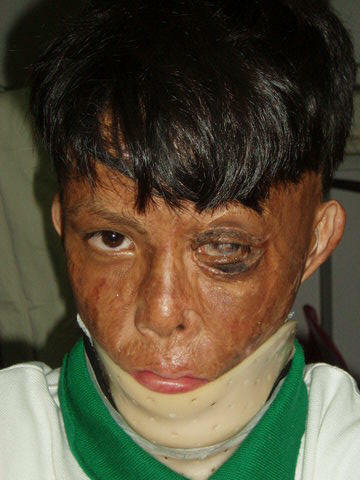 He also underwent a plastic surgery procedure on his neck and arm when his wounds healed but it was not successful. The skin that was taken from his thigh did not match his neck. His neck brace was prematurely removed, as the skin was still raw. JR’s upper arm and lower arm have joined, the pupil of his left eye scarred, his lower lip is pulled down to his chin which practically disappeared due to the joining of his neck, chest and shoulders. He walks shoulders hunched forward and bent arms dangling in front of him. He is indeed a pitiful sight to see. In fact, when JR was brought home that time someone fainted upon seeing his appearance. Yet this misfortune did not hinder JR to dream. To hope that his appearance would someday change so that he will no longer be an object of ridicule and be able to go to school and receive proper education. He wants to be a general – God’s general… someday. 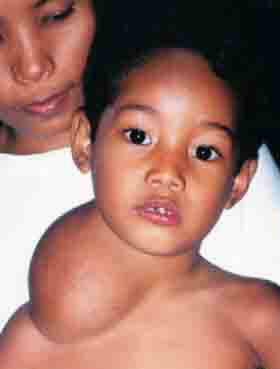 Arvee was born with this tumor on the right side of his neck. As he grows so does his tumor grows bigger. When we last saw Arvee his tumor was soft and very warm. He said that it hurts him at night especially when the weather is cooler because his tumor hardens. They brought him to the hospital in Mamburao (a town about an hour and a half from Barahan) but the doctor couldn’t operate and instead he gave him medication for a week and then sent them home. The doctor told his parents to prepare a big amount of money for his operation but the parents said they couldn’t afford the doctor’s rate. Arvee is a bright, inquisitive boy who deserves a bright future. Next year he is supposed to go to school. If he doesn’t get his operation soon he will be ridiculed in school just like JR. Right now we are in contact with Operation Blessing - Christian Broadcasting Network, thanks to the caring of our friends and partners, Lyford & Martha Morris, who wrote to them about the two boys. Operation Blessing has expressed interest in finding out more about the two children and to see what help they can do for them. We have given to Operation Blessing our contact persons in Barahan, Occidental Mindoro for them to coordinate with, and who are geographically close to the two kids. Please pray for both boys, that they can get the operation they badly need. Also pray that Operation Blessing will indeed be able to help them. We will keep you updated on any development.